How do we make sense of and respond to our experience of the world around us? How do we discern well together? By considering profound questions such as free wil and the place of life in the universe, Peter J Eccles casts an illuminating and engaging light on a key element of Quaker experience; "The quality of the experience when we come together in meeting for worship depends on each one of us. The Presence in the Midst is always with us, ready to sustain and support us. It calls on each of us to rise above our weakness and live out our true self." Peter Eccless studies and teaches mathematics at The University of Manchester. He is a former clerk to Meeting for Sufferings and to Yearly Meeting. If we cannot change what is happening on our street, why should anyone belive we can change the would? Politics starts with the local. There is inequality in all of our communities, so we must begin there, with practical action where is matters. 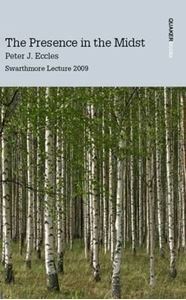 Tim Newell's 2000 Swarthmore lecture, revised for this 2007 edition, looks at possible Quaker approaches to criminal justice. The book includes insights from Circles of Support and Accountability as well as ideas for study and action.